Arizona Game and Fish sued over death of jaguar Macho B What will putting Yellowstone grizzlies back on "the list" mean? Here is Arnica fire incident page. The fire grew from 4 to over 1600 acres in 4 days. When the fire blocks the road, due to the closure of the other road to the north of the Park — the closure between Madison Jct. and Norris, there is no easy access to the north of Yellowstone Park if you are to the south. Next Tuesday could be a bad fire day but then also the end of the fire season as a strong and cold front with possible snow will blow in. Meanwhile warm weather. Currently the southern half of Yellowstone and both sides of the Tetons and points south are filled with smoke. See my earlier post of Sept. 23 (and updated Sept. 26). New fire in BTNF today too.. Went by the Gros Ventre fire today- it was burned to the road at Arnica CG. Ditch Creek fire seems stable. Bearpaw bay fire is MUCH bigger today, now 2,250 acres, area around it is totally closed, looks like Spalding bay road is burned. Should be interesting for bear viewing in the future, it was always so good there…it will be again eventually. Third Creek fire on the otherhand seems stable. Dont know much about the Alpine and Pinedale ones. USFS folks here in Calif are now admitting that they misread the danger of the 160,000 acre Station Fire in SoCal and did not fight it agressively enough when it started. Now most of the Angeles National Forest is toast. We will never know, but I suspect budget cuts are effecting USFS fire fighting decisions in the early stages of any fire these days. 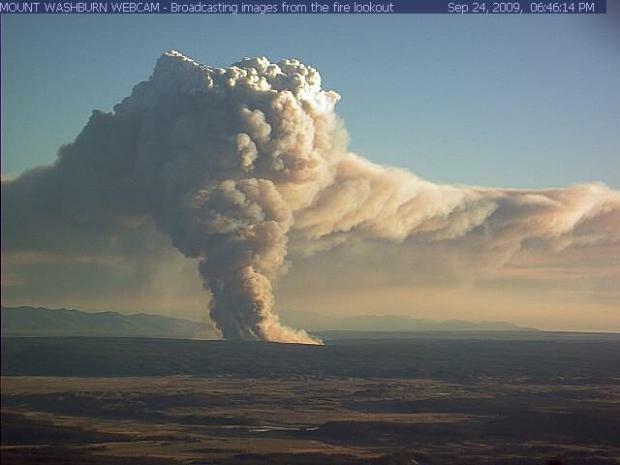 This is an interesting web site for monitoring fires….